Please email or call with current address/email/phone, so we can contact you about our reunion! 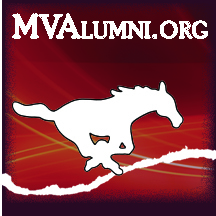 We want to keep the MVAlumni website up to date as much as possible. We also have a Facebook group - MVHS Class of 1978 - please join us! We had a great time at Andy Wolfe's house for our 40th reunion! It was a nice relaxed gathering of about 40 people. Please plan to attend Heritage Days every year as well as our next reunion. It's always great to catch up with old friends and to see beautiful Mount Vernon! MV Heritage Days has become quite an annual event for MVHS alumni to gather and reconnect with old friends. Class reunions from 5 to 80 years are planned! There are Fireworks on Thursday night, Flag Football tournament on Friday night, Live entertainment uptown both Friday and Saturday nights, and events on stage during the day too! The MVHS Alumni Association has a tent throughout the weekend to visit, a 5K run, breakfast and parade Saturday morning. If you haven't been back for Heritage Days, you should make a trip back this year! It's a great weekend for alumni!